As a developer, I will be releasing most of my software under the terms of the reboot.pro license. For example, releasing the next WinBuilder and other tools in a manner that brings an exclusive benefit and competitive edge for other developers at our community. You are welcome to provide comments and ideas for improvement. Would, by any chance, any of the batch scripts I posted on reboot.pro be considered "this software", i.e. should somehow this new license be "retroactive", just say so and I'll re-publish them elsewhere. As well, should I by any means, be considered an "official developer", please remove me from the list. Unfortunately, we saw over the past years a number of competing websites/developers misappropriating our tools, reputation and progress.Some of these developers use all that we offer and give little to nothing in return. The idea of "free" (as in freedom) is (in my perverted mind ) completely unlike that. So, a number of dirty little bastards somehow abused of things developed by the good members of reboot.pro? Do you think that a restrictive license would change anything? As if the good guys at reboot.pro always integrally respected other people's licenses. That is a nice model. Your scripts are subject to the site policies found on http://reboot.pro/about/policies that applies retroactively to all user generated content. I want to keep perfectly clear that a developer publishing his work at reboot.pro can choose whichever license fits his own work. If you don't accept the license, just don't use the software covered by the license and don't use it for your own products. The community license is available as an option, I am adopting this license for projects that I publish. If I want my own software available only at reboot.pro, it is my right to choose so. If a developer/site ignores the licensing terms of software that I develop, we now have a way to proceed with legal action. There are more developers in our community that share the same opinion and hence the reason for this license to exist. The same can be said for any other developer/company, licensing terms continue to exist and be applied. it is give so mutch right like GPL, MIB, APACHE and all what it is named..
and of course License of BSD too... do we need realy a brand new Licesing for Reboot.pro? I do not see it really a reasonable view on it..
Did George Orwell really say it ? It seems like it's a bit of a mystery. A license expresses the thoughts and desires from the author in regards to his software. I dont will missunderstand the the reboot.pro community license and have a few questions and critical notes. If a given software product is protected by this license, it means that its development was only made possible through the support of our community and the intention of making it available to the public is that it can benefit our developers and end-users. please define "the given software product who is protected by this license"
Unfortunately, we saw over the past years a number of competing websites/developers misappropriating our tools, reputation and progress.Some of these developers use all that we offer and give little to nothing in return. If you want to make use of software covered by this license, we only ask that you help us build a stronger community at reboot.pro and actively participate on the construction of this initiative. Please define "our tools, reputation and progress"
many tools (exe- and cmd-files and other are software or tools?) we use in projekts like win7PE_SE. They are creations of many developers. The projekt win7PE_SE is hosted in several forums for supporting. Please tell me. Have other community's like "msfn" or the "codebakers" or other lokal, not international community's to ask the reboot.pro administration for all new batches or tools for permission in reboot before publishing? I am shure that many tools are developed outside of reboot.pro. 1. Could you please give us examples for "software is included are exclusively supported at reboot.pro"? 2. Please tell me, is the Projekt Win7PE_SE a "software" or part of a software for ask the reboot.pro administration to allow downloading from an external site or tool? What will happen to the hundreds or thousands of download links to reboot.pro from private websites to make advertising for reboot.pro for win7PE_SE and host download for http://w7pese.cwcodes.net/projectindex.php free and other projects yet? The arguments are laudable to protect intellectual property. But what is it with non-European countries? The license rights protection in other continents and tracking at Offence for unlicensed software yet? who is disadvantaged by a licensing and who is not? Permissions and terms specified by this license can be revoked or modified in the future. If you do not agree with these terms of usage, you cannot make use of this software. in the current state for all "WB-Projekts" in which many people in many countries in many forums are involved in intellectual property for a good thing that so far worked without license very well. My last note: WinBuilder with reboot.pro runs internationally itself. Where are the real problems? Look at your avatar. My apologies for not replying to all points, my time is limited so I will reply to the last part and keep the reply short. You recently registered a domain name as reboot-pro.de and sell a product entitled "SARDU und Reboot-Pro-Multi-Boot-Rettungs-System". This product includes software that is made available for free and/or illegal to sell without a license such as Microsoft Windows. The reboot.pro community license is the least of your problems. The real problem for your life is the violation of DCMA and ACPA, besides the damage caused to our community by this identity misappropriation. We both live in Germany, I do not want to complain to the authorities but I want to see this matter solved. normal license like GPL or so to tell, "hey, this is lizenced and you cant sell it furter"
btw... is this soft not lizensed and in the German right not handeled ? but he has stolen it, or ? And the Rights of Name.. like my Multimoto.. Reboot.Pro name it is saved ?? 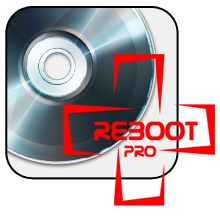 The first shold be saveing of the Name "Reboot.pro" with name ad Logo ! which licence it is the program continue"
Edited by Blackcrack, 16 May 2012 - 11:21 AM. This clause bothers me. What about Win7PE_SE which is also shared on MSFN and TheOven (I prefer to tell it myself than by others). Am I free to develop this project where I want ? If we see positive, it is more publicity for WinBuilder than a real competition, Win7PE_SE may even bring people from other site without harming here. I hope you see it like that ! How to understand the licence for WinBuilder, for projects and authors and maintain a certain freedom. I dont sell "SARDU und Reboot-Pro-Multi-Boot-Rettungs-System", i build it with only free bootprogramms with and in cooperation with SARDU for free. There are NO illegal sell with or without a license such as Microsoft Windows. Now please you have to take care and be careful with libel. EDIT: ...and in my homepage is no competition for you. My pages are purely informal. When you are in germany you will read right please. you don't have to use the license. Then it doesn't apply to Win7PE_SE. its definably not going to be feasible for all projects and programs here, but nice to have another option. winbuilder application scripts & publish them outside reboot.pro? If you want to use software covered by the community license, then what I ask is to help our community keep moving forward. According to your homepage, Win7PE_SE is supported officially at theoven and MSFN. Not a single link or mention to the community that supported and fostered your project since day one. If we are not welcome on your list, then I don't want you to feel bothered to add it just because of WinBuilder. You are welcome to keep using the current Winbuilder as always. If you say that users will still know that we somehow existed, your word is sufficient to me. Just understand that this community is very dear to me. Some of the new tools that I publish will be using this license. My friend, you can continue working as before, no changes are required and I am here to help in whatever is needed. Also, if someone has to "donate" money in order to get a product or service, I call this act as "selling". It is cyber-squatting: http://www.squidoo.com/cyber-squatting or in this case to be more specific, trafficking. and you cant read all? Einzelheiten zum Bau der Win-Live-Systeme geklärt werden. and details of the construction for the win-live systems must be clarified." under observance of the equal treatment of all users regardless of their origin and popularity. the one have permissions without license rights to make you popularity, the other not ... can not be taken seriously. license Right must apply to all but not only for individual user. Without going into old stories, you will understand... Done. I agree with Max post #17, Is it shared by all ex ! What about new tools, can we share them in the same way, here and elsewhere. My opinion is that if something is free why sell it? Why should I take care and be responsible for a thing sold by others who took it for free? Biggest software house give their free software and then earn from other sources, using such software for advertising, to sell professional versions, my daughter eats from my job of selling wine and liquor, for now the computer science it's just a real cost, this is the reason why I slowed down but no one forced me to do it, develop or not develope is only one my choice. My software is not necessary, all people can do whatever makes my software by hand, logically to get the same job that my software creates is in a few minutes it would take hours, days, having the capacity and the knowledge. People are free to use my software and accept the license (Attribution Non-Commercial No Derivatives (CC BY-NC-ND) ).